Now I’ll be honest, I have serious hots for Givenchy Antigona bag which is beyond by league and budget at the moment. So I was frantically searching for a bag which had similar vibes to it. And there are pretty much a lot of companies that have “dupes” as you may call it. But this one just spoke to my heart. So I had to get. 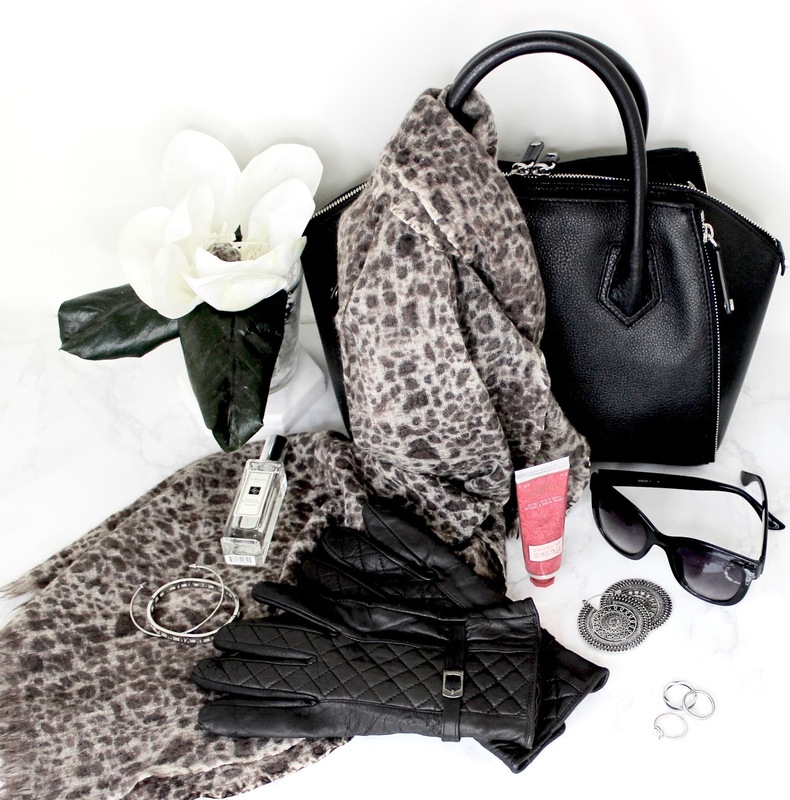 Plus a black bag is a wardrobe essential. And if you haven’t heard me rant about this bag then you know, I was in need for a good sturdy/fancy black bag. So before I start digging out from my bag, I quickly wanted to talk about it. Apart from having structural similarities to the one bag I can’t keep my eyeballs off. This one has more personality to it. The side zipper element adds more edge to your regular handbag, and plus it expands or compresses the bag according to your liking. Which I quite appreciate it, since there is a lot of baggage that comes attached to being a mom. Also what I love about this bag is two big accessible pockets on either sides. Instead of unzipping into a big pit of crumbled up stuff, it helps keep you organized. Over-all I’d say it is a very well made bag and holds up the structure beautifully without being too stiff. Hand gloves : Both me and my daughter’s. Every-time we get back home I make sure I keep the hand gloves back in my bag. Scarf : I usually don’t stuff it in my bag, instead tie is on the handles. Hand Creams : Not just one but two or three tubes of hand cream. You know its winter time right! Rodial Hyaluronic Face Mist* : You know what winters can do to your skin, and if you have a specially long day planned ahead of you. This is the best honest to god-damn moisture injecting product. Absolutely Love it! A tub of M&M’s : Every mum knows they need a savior. You never know kids, they can be temperamental and you need to be prepared, haha. Wallet : I have the same wallet from my previous what’s in my hand bag post. And I still adore it. Even though I feel it’s getting a little beaten up and I need to switch it soon. Hair bush, hair ties, a dozen of lip-products, Perfume, Hand sanitizer and a pack of tissues. Coupons : Half the fun of shopping is when you see how much you saved on your trip to the store. 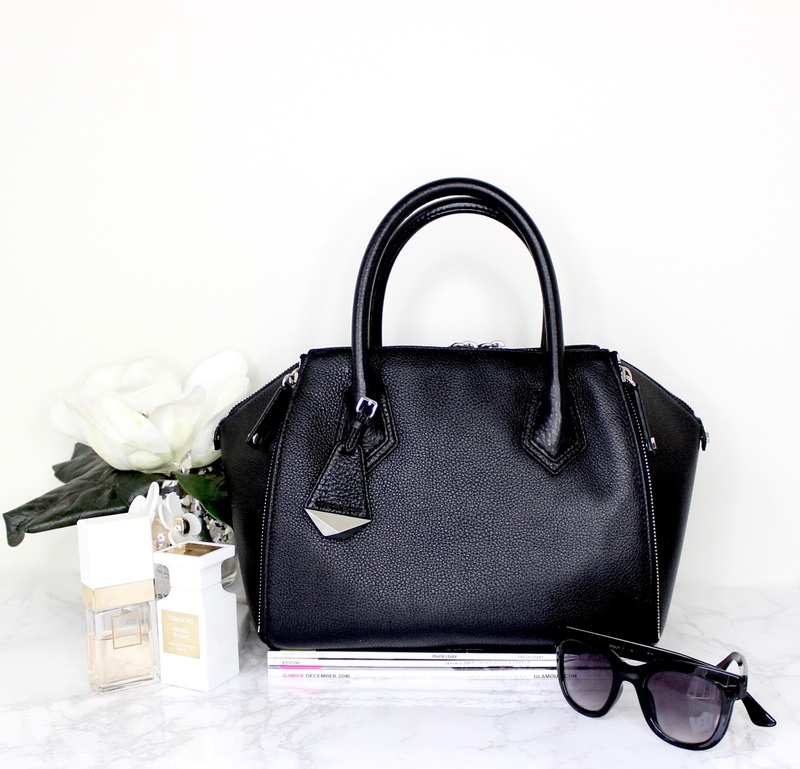 I have seriously been loving this Rebecca Minkoff Perry Satchel Bag and I love how it doesn’t get heavy or bulk with all the crap that I carry around. 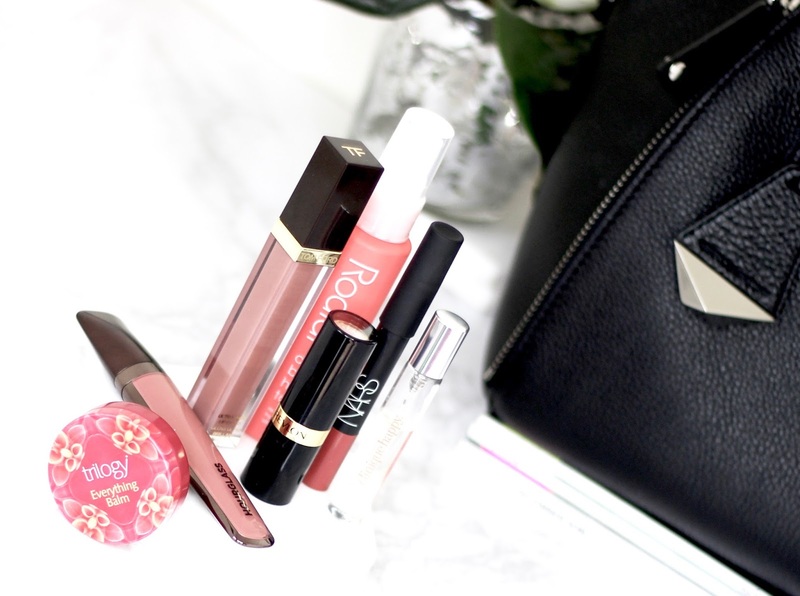 And now i’d love to know what are your hand bag essentials?